12th of Never by James Patterson and Maxine Paetro, narrated by January LaVoy, is a prime audio production with sound effects and music. This is like watching a fast-paced thriller without the images — but those images clearly come to mind. There are occasions when the narrator forgets what voice should be used, but it is so rare, that readers will forgive the little slips. This is how I prefer my Patterson these days. These are adrenaline filled novels that will have readers eager to finish the books in one day. While some books in the Women’s Murder Club series have fallen flat or have had too many mysteries going at once, 12th of Never is fantastic. There was a great balance between the personal lives of the women and the cases they were working — from the case of the corpse missing from the morgue to the case of the husband on trial for murdering his wife and daughter. Lindsay Boxer is on the sidelines for a big chunk of the book because of her family issues after the birth of her baby, but Cindy and Richie are front and center with their personal issues. Claire is facing professional problems since the disappearance of the body, and Yuki is juggling her personal life with the high-profile trial of a husband who may have killed his wife and daughter. 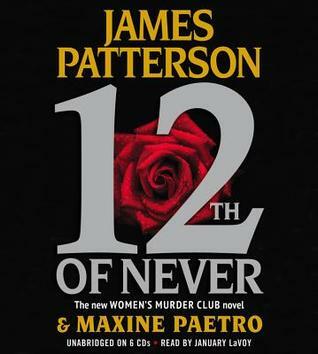 12th of Never by James Patterson and Maxine Paetro, narrated by January LaVoy, is a wild ride! I was riveted from the beginning, probably because I’m invested in Boxer and her family. I wanted to know what was going to happen with her and Joe and their baby, while I was disheartened by Cindy and Richie’s troubles. Yuki is the only character I still am on the fence about, and that could be because I instantly liked the former assistant district attorney Jill Bernhardt from earlier in the series. James Patterson is a prolific author of thrillers, mysteries, young adult novels and more. His first successful series featured psychologist Alex Cross. 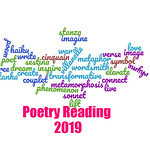 Maxine Paetro collaborates with best–selling author James Patterson, co–writing The 4th Of July, The 5th Horseman, The 6th Target, The 7th Heaven, The 8th Confession, The 9th Judgment, 10th Anniversary and The 11th Hour, just released in May 2012. All are New York Times #1 best–sellers in the Women’s Murder Club Series. Glad you really enjoyed this one! Serena, I can tell that you thoroughly enjoyed this audiobook! I haven’t read (or listened to) any books by James Patterson, but I know he has many, many fans, including some family members. Suko, these are what I call my mind’s junk food. Not too much thinking necessary, just enjoy the ride. I really love the audiobooks best. The productions are fantastic. Yay, I’m glad to see the series got back on track! I was really happy with this one. Maybe I should try the audio with this series. It was book 2 or 3 and I was like this doesn’t even sound the same as the first book. I don’t know if it is all the underwriters or what. I think Hachette does a fantastic job with the audios and the effects — it’s almost like watching a movie without the visuals in front of you.